The Día de los Muertos makeup looks I found were marvelous and inspiring. 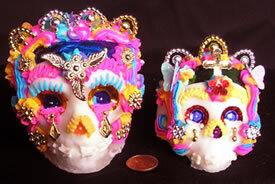 My understanding is that people decorate their faces like calaveras de azúcar (sugar skulls), which are tasty treats used to adorn altars during Día de los Muertos. The makeup represents the beautifully stylized, smiling skulls, brilliant colors, flowers, intricate swirling decorations and sometimes tears. Here are three Youtubers with interesting and beautiful Día de los Muertos makeup tutorials. If they inspire you, be sure and let the creator of the video know with a thumbs up and/or a comment on YouTube. Lost love… Día de los Muertos (day of the dead) makeup tutorial, by venusocean. I love her use of color, shading and rhinestones. Venusocean has a few different Day of the Dead makeup tutorials to choose from, so check out her channel venusocean to see more. I really like that she gives detailed instruction. There is a hair tutorial at the end. Plus, she suggest that you try variations on her look to find your own style. Warning! This youtuber does curse a bit, so if that offends you, don’t watch it. She is a bit rough around the edges but entertaining and she demos a beautiful Día de los Muertos look in spite of her allergies & tourettes.